When you live in Seattle, you know that sooner or later Seattle winter will come around and one thing about living in Seattle is that one must prepare for its winter. You would think it wouldn't be that bad, I mean it's not Minnesota where it's freezing for long periods of time and plenty of snow, but it is chilly and grey. Grey is what gets you. When 90 days of rain and clouds go by without more than 20 minutes of sunlight, it can get to you. I've lived here all my life and although it hasn't always bothered me, there are definitely weeks when I think "Can I take one more shade of grey?" The rain- not so much the problem, it's the grey and the "wet" cold, the deep-below-the-surface-in-your-bones-cold. I start climbing the walls in January and tear through my cupboards looking for caffeine or chocolate, anything for a little sunshine....and just when I think I can't take one more sunset at 4 p.m.-suddenly it's Washington Black Truffle time- and then, I'm smiling. Thank goodness for year-round farmer's markets! Go check one out, you'll be inspired for sure and you just might forget about the grey sky- for one day anyways. This last Sunday Mark and I were walking through Ballard Sunday Market and even though it was 30 degrees and lightly snowing on us, committed farmers, musicians and chefs were out displaying their produce, seafood and homemade pasta. We walked by the Foraged and Found Edibles Table and sure enough, a basket of sunshine- Washington Black Truffles! 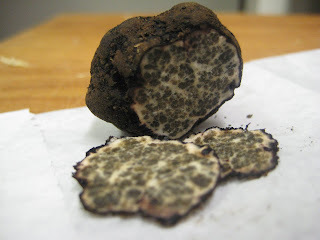 The woman at the table was smelling each truffle to find us a couple fragrant ones. She suggested we could make a cauliflower soup or pasta with them but to use them within 2 days or else freeze them, but all I kept thinking was how amazingly delicious they would be with scrambled duck eggs! We ended up using one that night in a roasted cauliflower soup with homemade chicken stock and some caramelized onions. It was delicious, I don't want to write down the recipe yet, because I think it could be improved upon. I will say that with Washington Black Truffles, I would use more than I would an imported truffle, because their deep, earthy umami flavor is more subtle. How appropriate to end the weekend on such a decadent dish? For come Monday I am detoxing, and I'll be a slave to the blender for a week. And just like the grey skies of Seattle winter make me ache for the coming spring, even the smallest bite of chevre, a buttered piece of toast or a deep glass of red wine is going to taste like sunshine on my grey tongue.